The HR Strategic Planning Workshop is designed specifically for HR Directors, VPs, Heads, Executives, Managers, and business leaders. This is a 1-day session that will empower HR and Business Leaders to discover and expand the capability and effectiveness of their human capital practices, build practical solutions, and know which activities to pursue through human resource planning. For the pre-activity, participants will be accomplishing an online HR Diagnostic Tool (approx. 120-150 minutes to complete) that will capture how they attract and retain talents, measure performance and value, reward and recognize, build talent capability and institutionalize process and culture. 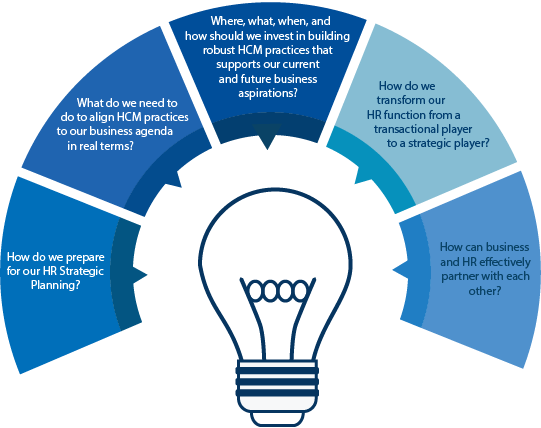 One of the key objectives is to create an action roadmap for their HCM practices that can be implemented in the organization. 1. The hotel’s parking space is located at Ruby Road.